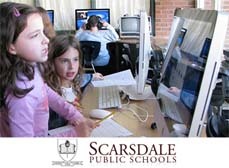 When Scarsdale School District started discussing the need for a district-wide computer programming sequence, addressing teacher anxiety and lack of coding experience were some of the most challenging problems to solve. They were looking for an easy-to-implement solution, with curriculum to support learning in other subject areas, while easily supporting classroom teachers. Jerry Crisci, Director of Technology, and Paul Tomizawa, Head Elementary Technology Teacher, shared their insights for going beyond an Hour of Code and their reasons for choosing Tynker for their technology instructional needs district-wide. How do you envision programming being taught in your district? Our teachers have designed maker spaces in our schools to help our students understand the entire design process from idea to creation. We believe students should code because it reinforces critical thinking, computational thinking and problem solving skills that will benefit them in all areas of life. In elementary grades we want our technology teachers to work in conjunction with classroom teachers to achieve desired learning outcomes through technology in a project-based approach. We just completed a 1:1 rollout of Chromebooks to 5th graders and are bringing the initiative down to 4th graders for this coming year. Utilizing our Chromebook initiative was a major requirement and Tynker’s integration with Google Apps for Education made implementing the program much easier with student single sign-on. At the middle school level, technology instruction is oriented towards both coding and project based learning. In the sixth grade, every student passes through a technology sequence because we feel that all students should have the opportunity to code and create. We’d talked about beefing up the computer science and coding. We thought that finding a solution that gets students started at younger ages, while developing their logic and problem solving skills across grades, would allow us to properly prepare students with 21st century skills. Why was it so important for you to offer programming in your district? We’ve always told our teachers, especially those who are intimidated by computer science, to think of programming as a storytelling medium. We want students to develop literacy skills and share narratives in new ways. Coding provides students with the opportunity to express themselves while developing skills and abilities they didn’t know they had. There was a particular student who was often quiet academically, but gained recognition and appreciation for his ability to program. Tynker becomes an outlet for expression for students who may not be comfortable with outlets currently offered in the classroom. Not only is Tynker is designed to appeal to the diversity of learning styles in the class, it also provides a counter narrative to the story line of high stakes testing. Kids have other aspirations than getting high scores on tests. These creative opportunities are essential for them to succeed during the school day and later in life. What was the biggest challenge you faced when selecting a computer programming curriculum for your district? We have technology teachers, but classroom teachers are important partners in our work, so we needed to find a solution that they could easily support. We have offered MicroWorlds Junior and Scratch in the past but some teachers were not that comfortable making programming a part of their instructional program. It was hard to develop a coding program and also do it in a way that teachers could be independent and supported by resources. Code.org’s Hour of Code was a big deal throughout the district and this is where we became familiar with Tynker. Teachers and students really enjoyed it, and that opened the doors to using Tynker’s curriculum to go beyond an Hour of Code. Tynker met all of our requirements for beefing up our coding program. It really appealed to our middle school instructors because Tynker’s lessons are organized into sequences so students can do the work independently. That’s how Tynker takes the edge and anxiety off doing more with programming in the classroom. Now, I can tell teachers that students can work independently and move at their own pace, and teachers can, too! Any final thoughts that you would share with other teachers/administrators for starting a coding initiative at the district level? There never seems to be enough time for students to complete their projects in school. For any school or district that is in the middle of a 1:1 Chromebook initiative, giving students the ability to continue coding at school or at home is extremely beneficial. We love that Tynker is completely browser-based and allows students to log in from school and home to complete their coding projects during their own time. The best way to empower students is through knowledge, and Tynker’s curriculum, with its scaffolded approach, does just that. Tynker helps advance our learning goals to the next level while addressing many of the challenges that schools and districts face as we upgrade our coding curriculum. From reducing teacher anxiety and meeting grade-specific learning outcomes, to providing an outlet for student expression and collaboration, I’m glad that we’re adopting Tynker for all of our schools. Interested in doing more with computer programming at your school? Gavin Loves Coding…And Treasure Hunting!